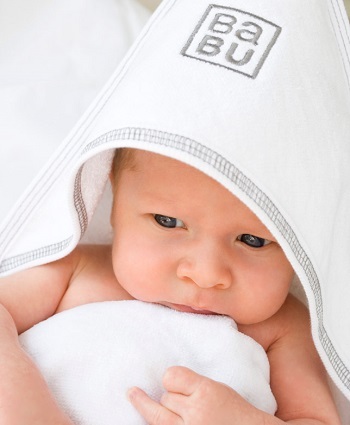 Organic baby hooded towels, incredibly soft, absorbent and extremely cute. Comes in a lovely gift box, match up with our facecloths for the cutest baby shower gift. I bought this towel for my grandchildren and so pleased with it. This towel is lovely and thick and so soft for baby. Highly recommend. I bought this towel for my daughters first baby and she was over the moon for she had purchased one (earlier without me realising )and loves it so much that she wished she purchased another. Ta Da Her wish was granted. Thank you Babu for making a super soft towel for delicate skin. Beautiful, soft and luxurious. I bought this hooded towel for an expecting friend. She absolutely loves it and I know is planning to purchase a second one. Great as a baby shower gift! I have had two of these towels for close to two years now and they are still almost like new. So thick and soft and the velour side is still super velvety. I love them. I've just purchased the toddler towels and am happy to pass these ones onto my new baby as they have washed so well!